Arts Integration Works Says Portland's "Right Brain Initiative"
more than the average annual rate of increase. 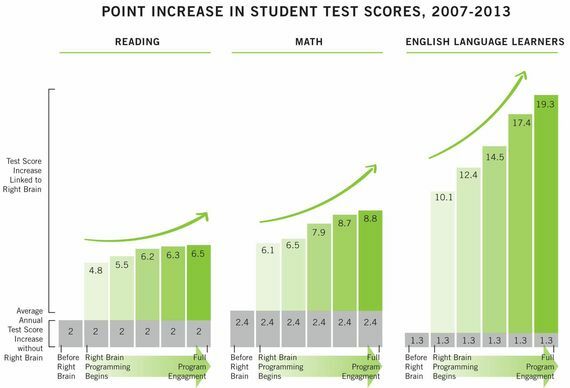 increased 10 times more after schools partnered with Right Brain. The study released today tracking student progress over a 5 year period, was conducted by WolfBrown, a leading research and advisory firm serving a wide range of foundations, public agencies and charitable organizations. RBI was launched in 2008 by a unique collaboration of artists, art and cultural organizations, school districts, governments, businesses and donors who believed in the concept of "arts integration", using the arts as a catalyst for teaching across the curriculum, and in the process creating a truly interdisciplinary curriculum. RBI agreed to embrace arts integration as few other regions have done. Other than teacher retraining, their approach is not more classes, more arts or music, more anything. That would be nice but, frankly, there is not money for doing anything more, only doing things differently. As the RBI Study shows, the initiative is working. According to Rebecca Burrell, Outreach Specialist at RBI, we are convinced that it is "art integration that makes the difference" in the progress being made in the schools. This school year, RBI is bringing arts learning to over 20,000 students at 59 K-8 schools in seven districts. The arts integration education initiative serves every K-8 classroom serving Clackamas, Multnomah and Washington Counties, including the metro area of Portland, Oregon, and its changing teachers as well as students. Is is also making it easier for them to embrace the principles of the Common Core being adopted by schools districts around the nation. This is auspicious news to be sure, but while this represents a tremendous show of progress toward creating real world interdisciplinary curricula, the work is not over. As most advocates of the arts and arts integration know, the struggle to recognize the important role of the arts, and art integration has been extremely difficult. As far back as 2002, a unique consortium of arts organizations expressed it in a report called "Authentic Connections." They said then that such interdisciplinary work in the arts enabled students to "identify and apply authentic connections, promote learning by providing students with opportunities between disciplines and/or to understand, solve problems and make meaningful connections within the arts across disciplines on essential concepts that transcend individual disciplines." That was mostly anecdotal though well founded. There remained many, simply put too many, people that saw art as nice but not necessary...children's art, even less valuable. Sadly, that is true even today perhaps because many people don't take the term "arts" seriously. It's soft, not muscular unlike the sciences where there is more certainty, more equations, formulas etc. Art by contrast is uncertain. "There is an inevitable rise in bureaucracy, with paper replacing people, and experience increasingly virtualized. In going all out for what we believe will be our own happiness, we exploit the world and see ourselves as alien to it, rather than seeing that our happiness depends on being part of it, and therefore on helping it to thrive. This is the world of the left hemisphere, ever keen on control". The right, as well as the left hemisphere of the brain cry out for nurturing, and the future of America depends on reinventing the way we think, and in the process, how education is redefined. Fortunately, more neuroscientists, psychologists, educators and others are finding that the arts help nurture the right hemisphere of the brain. 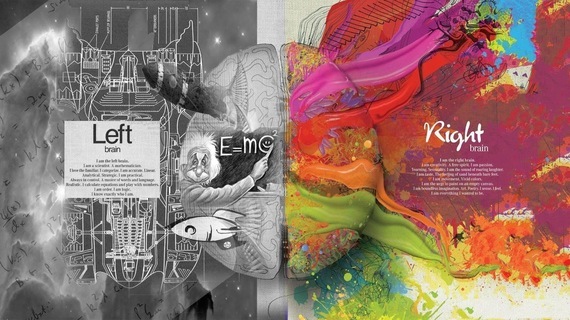 This is exactly what the more left brained curriculum needs to create the new thinking skills leading to creativity. We now know a lot more about learning and know "arts integration" works. The President's Committee on the Arts and Humanities, in a report called "Reinvesting in Arts Education: Winning America's Future Through Creative Schools." has said as much after spending years of research and study. According to the Committee report, "Cutting-edge studies in neuroscience have been further developing our understanding of how arts strategies support crucial brain development in learning." "The Turnaround Arts program has exceeded not just our expectations, but our wildest hopes and dreams. With the help of this program and some School Improvement Grants, math and reading scores have gone up in these schools... attendance is up, enrollment is up...parent engagement is up... suspensions have plummeted...and two of the schools in our pilot improved so dramatically that they are no longer in turnaround status. And today, the students in these schools are engaged in their education like never before." Author and educator Mihaly Csíkszentmihályi calls such total emersion in a task, FLOW...a " mental state of operation in which a person in an activity is fully immersed in a feeling of energized focus, full involvement, and success in the process of the activity." Dr Richard Restak in his book, The New Brain seems to agree. He uses the words "plastic" and "malleable" to describe the brain. He believes that we can be creative by acquiring the right series of "repertoires;" that we can "preselect the kind of brain (we) will have by choosing richly valued experiences." As demand for a new workforce to meet the challenges of a global knowledge economy is rapidly increasing, few things could be as important in this period of our nation's history than reinventing education. While not everyone sees the Arts as the answer to America's economic prosperity, and in Washington, D.C. the differences in viewpoints become a matter of contention at the outset of any issue regardless of the merits. But the evidence is mounting, in Portland and in other communities, in favor of blurring the lines between art and science, and developing more real world interdisciplinary courses.